Nokia has just reported Q4 earnings. The only part of Nokia that matters is their handset division. The only part of their handset division that matters is Windows Phone Lumia. As those sales go, so goes the company. Though unit sales doubled in 2013, Nokia is still losing money. Worse yet, sales declined in the holiday quarter from Q3 of the same year. That's kind of amazing! Fewer people wanted a Nokia handset during the holidays than they did for the three months prior. Even an unimportant, second-tier product should increase during the holidays. 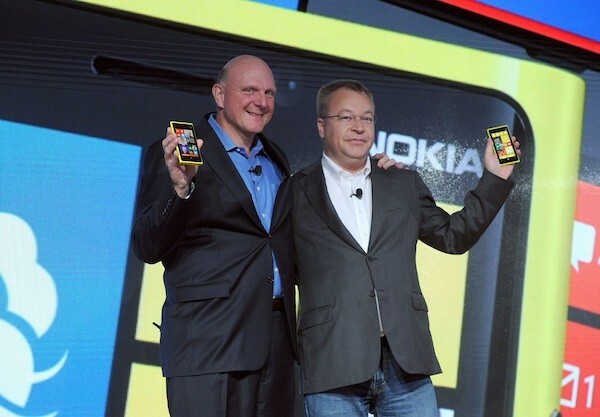 This pretty much tells you everything you need to know about Nokia, Windows Phone, and the harsh reality of 3rd place. But enough about Nokia. They have been dead for a long time before they sold to Microsoft. They were dead when the only markets they dominated were the ones with depressed economies. At the time, their weapon of choice was called Symbian. They sold a lot of phones but made no money. Nokia can tell you twice over, there are no winners in the race to the bottom Nokia hoped Windows Phone would carry them upmarket. Microsoft hoped Nokia would just give the platform any kind of marketshare. Bottom line, Nokia swapped Symbian for Windows Phone. Nothing else changed. Nokia handsets still do not have a foothold in developed markets, and Microsoft is the new Nokia. They sell cheap handsets into depressed economies that make the company no money. Like the villain in "Meet the Robinsons", I don't believe they thought it through. Last year, Microsoft's platforms was in a heated battle for #3... against Blackberry. When your greatest rival is Blackberry, you have already lost. At the time, Microsoft, along with many tech pundits religiously believed that there was some significance in being the #3 platform. iOS and Android are a lock for numbers one and two for the foreseeable future. Before engaging in a death-match for third place, it would have been prudent to ask if achieving the goal would be meaningful. I see a lot of situations where two choices are available. It is rare to have three, equally strong choices. The consumer desktop industry has worked itself down to Windows and Mac OS. The US has two major mobile carriers. The other two have been bought, or are trying to be bought. We have Democrats and Republicans. You get the idea. There was never any reason to believe that there would be three or four major platform players in mobile. The problem with being #3 in the platform wars is that the anti-preference has rapidly diminishing returns. This brave new world started with the iPhone and iOS. There was obviously going to be a #2 because there are a lot of people who would rather visit a drunken dentist than an Apple store. Android built its business on being the anti-iPhone. If you hate Apple, but have iPhone envy that you don't like to admit aloud, go for Android. Frankly, there is not a lot of oxygen left in the room for the anti-Android crowd. The #3 platform is for the person who hates both Apple and Android, but still want something similar. There just are not enough people to sustain this market. Between iOS and Android, practically all smartphone needs and desires are fulfilled. At the top of the range, we have the most elegant and user-friendly smartphones ever conceived. At the middle and bottom of the range, we have phones that provide a lot of utility and cost next to nothing to purchase and own. There are no app categories that are not covered. There are no styles and sizes that are not addressed. At this point, the only reason for a third platform is to get all of these benefits with a different logo. Right now, the only thing that can help Windows Phone is for Blackberry to finish dying out, and cede its marketshare to Microsoft. Even so, I doubt that would be enough to make Windows phone a viable #3. Furthermore, such an eventuality simply isn't going to happen. There is strong evidence that the vast majority of people leaving Blackberry are going to iOS. Android is picking up the remainder. No one wants to go from the #4 platform to the distant #3 platform. They want to go straight to #1 if they can. Going from one dying platform to another benefits no one. Where does Windows Phone go from here? Realistically, nowhere. Microsoft seems content to help Nokia push $100 smartphones into depressed economies. They have already bought Nokia. Even if they switched the branding from Lumia to Surface Phone, it wouldn't change the economics of the situation. What Microsoft needs to somehow do is build the phone that people want, and not just the one for which people will settle. According to the report, Nokia sold 8.2 M handsets in Q4, almost half a million fewer than the quarter before. In contrast, iPhone sales are estimated to be 55 - 60 million for the same quarter, significantly up from the previous. We should have the exact numbers in a few days. The only way to survive as #3 is to have a passionate following. At that position, it is not enough to have people settle for your device when no other options remain. For a long time, Blackberry survived on the passion of their constituency. Once that started eroding, there wasn't much left. Nokia fans had that passion before Nokia started producing Windows Phone devices. Soon after, those fans started moving on. Microsoft has no passionate fan base for Windows Phone. It is not the aspirational phone people want. It is the $100 phone in certain markets that you can afford. If they can change that, they might have a chance of being a viable niche. If their fortune does not change quickly, I predict they will be out of the smartphone business in two years. Newer:Lies, damn lies, and the Moto X wood backsOlder:What will put the "Pro" in iPad Pro?